Ready to ring in the New Year? Why not ring it in with delicious style? 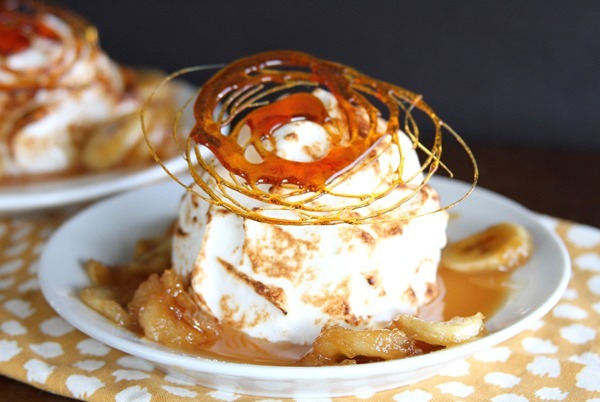 Salted Caramel Banana Pudding Cheesecake Flambé is exactly the kind of recipe that would make that a reality. Believe it or not, creating these mini-masterpieces isn’t at all difficult or terribly time consuming. 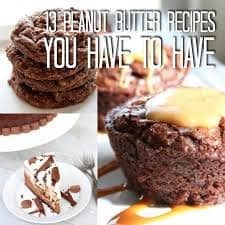 The few steps are quite easy, and made much easier with the use of a KitchenAid Stand Mixer and the powerful KitchenAid Commercial-Style Range. 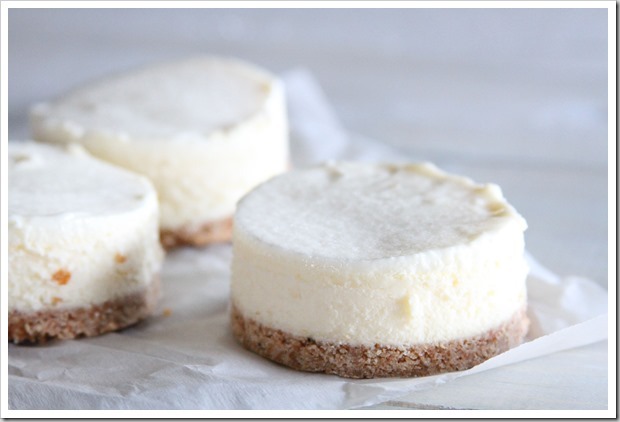 The first step is to prepare your cheesecakes, which are a snap. 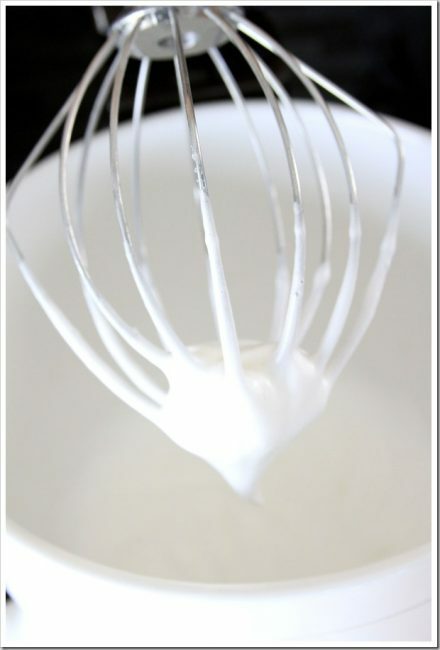 Utilizing the KitchenAid Stand Mixer fitted with the paddle attachment makes the whipping of the cream cheese batter a breeze. Be careful not to over mix the batter once you have added the whipping cream and sour cream, just gingerly mix those ingredients in until they are combined. Tis will help you achieve a dense, yet lofty, cheesecake. The recipe below calls for a silicone mold, and these molds are a gem for projects like mini cheesecakes. However, if you do not have one, never fear! You can certainly make your cheesecake in an 8×8 pan and cut the cheesecake into squares once it has cooled completely. Just be sure to adjust the baking time to roughly 1 hour. To make the crust, simply follow the directions. Placing the crust between layers of parchment paper make the process so much easier, and cleaner! No one likes having to clean a messy counter if they don’t have to! Once the cheesecakes have baked and cooled, and the crusts have been baked, it’s time to assemble! As you can see in the photo, the naked cheesecakes here were placed of top of round crusts. Again, you could make yours without a mold, and serve the cheesecakes as squares…it tastes just a delicious! The next step in the process is to make the meringue. 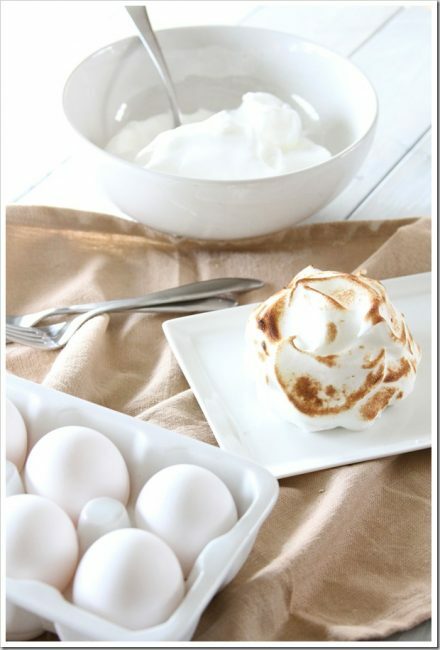 Meringue has a reputation for being difficult, but as long as you follow these simple steps, you’ll have no trouble at all. First and foremost, be careful not to get any yolk in the egg whites when separating. You may even go as far as to separate each egg individually over a mug versus directly into the mixer bowl – this will save you from having to discard all those perfect egg whites if a little yolk slips in on the last egg! 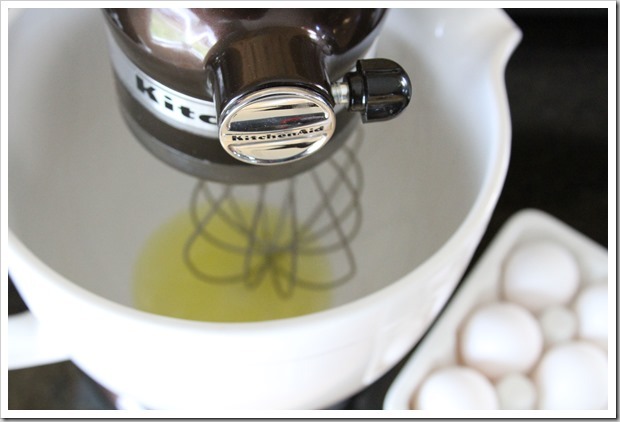 Finally, makes sure the mixer bowl and whisk are very clean – no oil allowed! Begin whipping the meringue until you have soft peaks, and then gradually add the sugar in a steady stream until the meringue is lofty and white, and is holding stiff peaks. Voila, you did it! Spoon the meringue onto the prepared cheesecakes, using a swirling motion. Cover the top and sides completely! 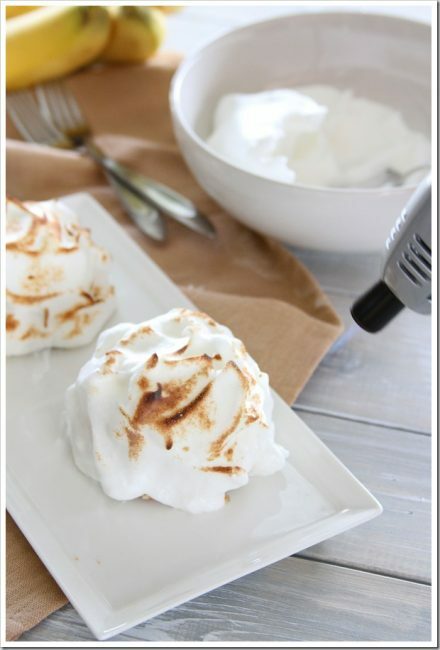 Using your kitchen torch (or oven broiler), torch the meringue until it is golden brown and gorgeous. 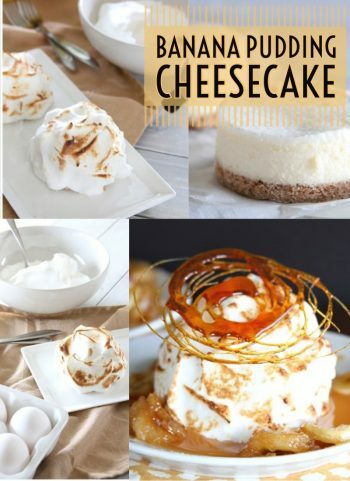 Remove each torched cheesecake to its own serving dish, and keep refrigerated until ready to serve. 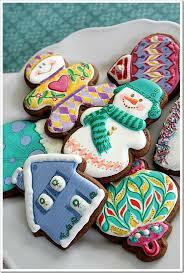 You can prepare these the day before if you like, just keep them chilled and covered. Bring the brown sugar and cream together until golden, and add in the slices of bananas. 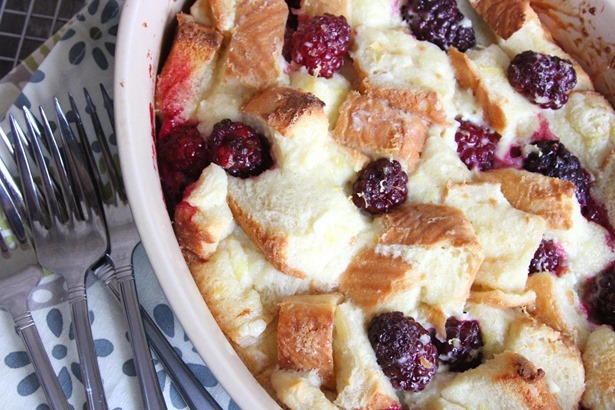 Be quick, you don’t need this to overcook and end up with mushy bananas. Now, here comes the fun part! 1. Place one 8-ounce package of the cream cheese, 1/2 cup of the sugar, and the cornstarch in a large bowl. Beat with an electric mixer on low speed until creamy, about 3 minutes, then beat in the remaining packages of cream cheese. 2. Increase the mixer speed to high and beat in the remaining sugar, then beat in the salt, vanilla, and almond extract. Blend in the eggs one at a time, beating only until completely blended. Mix in the sour cream and heavy cream with the pulverized Vanilla Wafer cookies. Be careful not to over mix the batter. 3. Pour the batter into the silicone molds. Bake the cheesecakes at 325F for 25 minutes, or until set. Allow to cool in the oven with the door propped open. 1. In the bowl of a stand mixer, cream together the butter and sugar. Add the egg and beat until combined. Scrape down the sides of the bowl. 2. Add dry ingredients and mix on low until combined. 3. Chill for 30 minutes, then roll half of dough between two floured pieces of parchment paper. Press into round cake pan or, if making minis, cut into desired size. Freeze remaining dough for later use. 4. Bake at 350 for 12-14 minutes, or until golden brown. Place one mini cheesecake onto one cookie crust. Top with meringue, covering entirely. 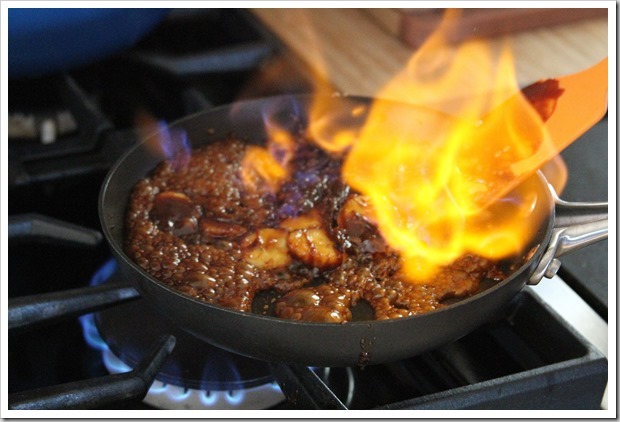 Place under broiler to brown, or use kitchen torch. 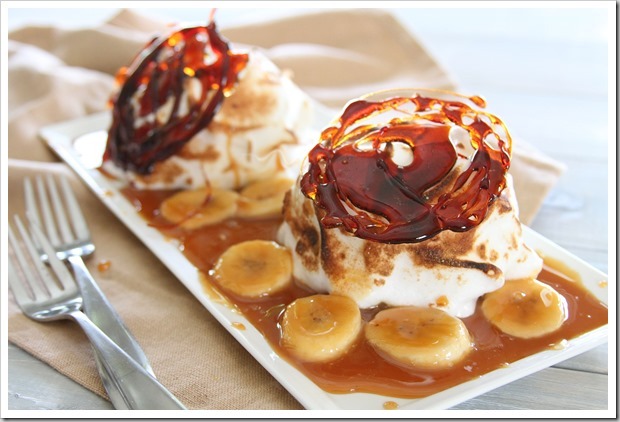 Add flambé bananas and caramel around edges of meringue topped cheesecakes. Serve immediately. Disclaimer: This post was created for KitchenAid. All thoughts and opinions are my own.